Tom Bowen working on a young disabled child. removed, his walking stick resting against the bed. As a young man, Tom Bowen’s exposure in Melbourne to a unique healer of the 1930s-50s gave him insights to a remarkable way of working. His special talents, based on exceptional palpation and observation skills, allowed him to further develop the outstandingly simple, yet incredibly effective technique. His fame as a healer soon drew people from around Australia to his clinic in Geelong, Victoria. He was one of the busiest practitioners in the country. Bowen never ‘trained’ anyone in the technique in a formal sense. Instead he allowed a small number of people, at different times, to observe him work and it is from some of these people that different interpretations, based on the principles of the work, have been developed. His level of compassion marked him as a special man. He was renowned for providing free treatments for sports people and those in public service, such as police. But his most outstanding work was with disabled children and their carers, for whom he provided regular free clinics. This has inspired the growth of similar free clinics in several countries. Suffering hearing problems almost throughout his life, he was later dogged with ill-health but his level of compassion never faltered. Following amputation of one leg he continued to work but after having his other leg removed in 1982, he contracted an infection while in hospital and sadly passed away. 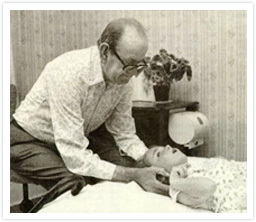 Tom Bowen was a unique healer who inspired the rapid growth of a dynamic manual therapy. Interpretations of the work are now being used throughout the world with therapists from many walks of life impacting positively in their communities, often where many other techniques have largely failed to impact.